This is a white button badge with the word LOVE written in super cute fancy red font with two love hearts. 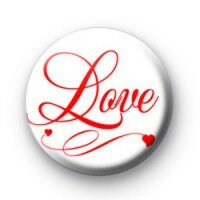 This button badge is a lovely token of your love and would make a thoughtful romantic gesture. Our badges are handmade in the UK. Why not support handmade and use our badges on Valentine's Day, or even as keepsakes from your Wedding Day. With over 6000 badges in the shop, we are confident we will have exactly what you're looking for.